When Jennifer, an Independent PartyLite Consultant, contacted me about doing a review and giveaway, I was super excited because I have never had the chance to experience PartyLite before. Jennifer sent me 5 tealights in different scents: Mulberry, Sea Salt & Driftwood, Orange Zest, Tamboti Safari and Mango Tangerine. I've actually never used tealights before because I always thought, "They're so small...there's no way they can throw out a lot of fragrance". I am very happy to report that these little candles filled my room up with as much fragrance as any votive or pillar candle has! My favorite scent was Sea Salt & Driftwood. I spent many of my younger years living by the shore so I have a soft spot for coastal scents. I do have to say though, that the Tamboti Safari candle was very nice too. It has scents of herbs and citrus, along with "masculine" notes of amber, cedarwood, musk and spice...so a little sweet and spicy, very interesting! I LOVE this fragrance warmer! PartyLite sells much more than just candles; home/outdoor decor, fragrance warmers, flameless fragrance (oils, diffusers, etc)...even Two Sisters Gourmet food products! There are quite a few specials going on right now, so be sure to visit her site and check it out. (I highly recommend the Summer Sale, where you can find items 50%-75% off!) Jennifer will personally send anyone who places an order a free gift! If you're interested, you can host an online party where you'll receive some nice hostess rewards as well as a gift from Jennifer. If you have any questions about placing an order or hosting a party, you can contact Jennifer a number of ways here. Jennifer would like to offer one of my readers the chance to win a $25 gift certificate that can be used on her site! The only mandatory entry is to like her PartyLite Facebook page, where you can stay up-to-date on any upcoming sales, promotions, etc. You can also sign up for the newsletter for extra chances to win. This requires creating an account at Jennifer's site, so it will be worth 10 entries! Giveaway ends at 12:01am EST on 4/24/12. GOOD LUCK! This giveaway is solely sponsored by Jennifer DeFoy, an Independent PartyLite Consultant. It is not affiliated with PartyLite the company in any way. Prize fulfillment will be provided by Jennifer. 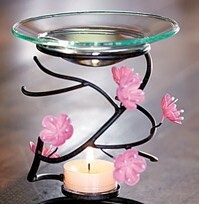 The Cherry Blossom Fragrance Warmer is very pretty! I also love their diffusers! :) LOVE Partylite!!!!! I like the flutter candle sleeve.Thank you for the great giveaway. ScentGlow® Warmer Tuscan Sunflower!! It's the state flower here in KS! I like the flameless fragrances. ScentGlow® Warmer Welcome...I love it and I have to have it! lol.. I love all of these, lol! I would love to win the chrome sconce set...they are beautiful! i love the flameless fragrances! I just love candles, so it's very hard to say what my favorite is. I do however like the Hanging Votive Lantern! 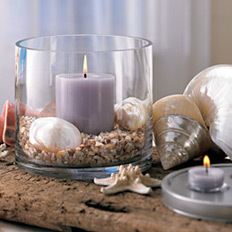 I'm candle obsessed but prefer in jar, i would love to try the Natural Rituals™ Soy Jar. I like really fragrant candles and the Cherry Blossom Fragrance Warmer. I really like the amaretto hurricane! I like the flameless fragrances best. I love the Weathered Zinc Lantern. I so hope I win this one. It would be a great mother's day gift to me since I am a single mom and my boys are 3 and 2. They can't really buy me anything. I really like the Forbidden Fruits Jar. The candles. I am not a big fan of the holder since i already have a lot of my own. So it is all the different types of candles i can get, i really wish i could still get Cherry Orchard, i really loved that scent.